Extra virgin olive oil is a natural juice full of flavor and aroma, with high vitamin A, D, K and E content. 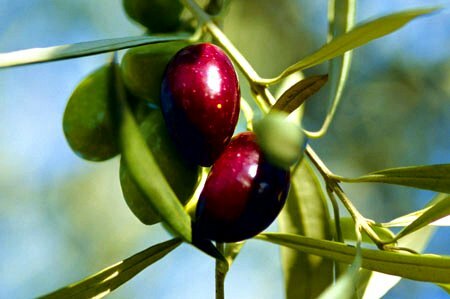 It has an anti-oxidant effect on the human body cells - 80% of extra virgin olive oil works as a protection against cholesterol, while it stimulates bone growth, and calcium absorption. Fats and oils are an essential part of a balanced diet. Olive oil is easily digested - and quickly and completely absorbed by the system. In addition, trace components like chlorophyll help the absorption, and the aroma and taste stimulate our appetite - an important assist for the digestive process. A diet that includes olive oil aids the circulatory system thereby reducing the risk of arteriosclerosis and other circulatory ailments. The non-saturated fats, which make up olive oil, not only are cholesterol-free, but also have actually been shown to reduce cholesterol levels. Frank Sacks of the Harvard School of Public Health writes: "An olive-oil-rich diet is more effective than a low-fat diet in controlling and treating obesity. Moreover, it leads to longer-lasting weight loss and it is easier to keep to because it tastes good."